Sometimes you just have to blow something up. 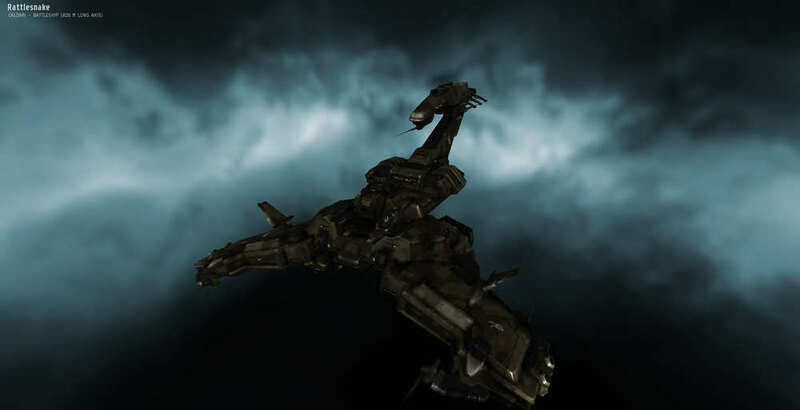 Nothing is more convenient for satisfying the destructive urge in EVE than running a quick mission or two. And if you're going to run missions, why not do it well and make some real ISK in the process? To that end, behold my current favorite level 4 missioning ship fit: a Rattlesnake with Large Micro Jump Drive. First suggested to me by a UNI colleague, Stoneloon, I experimented with the LMJD in several fitting configurations before settling on this one. This monster is a level 4 mission-running machine. Jump in, find the nearest targets, align away from the little red crosses, engage micro jump drive - and bingo, you are over 100km away from the rats. Deploy sentries, kill everything, rinse, repeat. I keep a 3-minute countdown timer handy on my mobile phone to let me know when the next micro jump is available. You absolutely need excellent sentry drone skills to make this work - mine are maxed out, which gives me 120km control range. I snipe using Wardens first, then switch to Bouncers or Gardes as targets get closer. Wardens provide 526 DPS - Bouncers: 614 - Gardes: 702. The cruise missiles are used mostly to draw aggro from more distant target groups, though they do contribute another 165 DPS. It's rare that I have to micro jump again to regain more range. I've tried this with a fully blinged-out faction fit, but frankly, the Tech II modules shown here are more than enough to make this ship very effective. I do need the Caldari Navy BCSes to meet CPU fit limitations, but that's my only faction module extravagance here. It's a low-effort ship to fly - cap stable, and well tanked with over 112K EHP. Resists are 64/71/79/82. I mission against Angels mostly, so this is about perfect for me. I've run the bonus room in Angel Extravaganza using this fitting many times, and it's always absurdly easy - a stark contrast to running the same room with a heavy armor tanked Dominix, or even a relatively speedy Machariel, where incoming damage always made things a bit hairy. I keep playing with the rigs, and am not entirely satisfied with the current mix. But it works very well, so I can't complain too much. Suggestions, anyone? UPDATE: the Kronos expansion changed some of the key characteristics of the Rattlesnake, and so I have revisited some recommended fittings in this post. Posted in Fitting and tagged with Rattlesnake, PvE, LMJD, Stoneloon, Mission-runner. May 4, 2013 by Neville Smit.